Complete systems are available from 600 to 6000 amperes. Standard conductor components, complete collectors and collector parts are available for existing systems. Specialty collectors and conductor components are available for new or existing systems. We can customize your system components to suit special environmental or atmospheric conditions. Features and Benefits - The MacCabe inverted "V" crane conductor systems were developed to provide an efficient means of providing high-capacity electrical service to all types of cranes and material handling equipment. Inverted "V" rail is most suited to outdoor applications where icing and contamination are present. The inverted "V" is extruded from highly conductive aluminum, but copper and bronze are also available. A PVC cover for personnel protection is also available upon request. The rails can be cut to customer specifications and designed so no field welding, drilling and cutting is necessary. Our sales and engineering staff is available to assist in system selection and design to fill your requirements. Conductor Rail - The inverted "V" rail is designed for all types of trolley and bridge applications. The conductor should be mounted in an under running condition. They are usually mounted horizontally, but can be vertically stacked. Phase to phase spacing is determined by collectors and conductor rating. The conductor is keyed for proper installation and is extruded from highly conductive aluminum in 30 foot lengths. Shorter lengths can be factory cut to suit the systems requirements. Collector Assemblies - Collector assemblies are used to pick up current from the conductor rails and transfer it to the crane. It is recommended that they be mounted in an under running condition. The contact shoes travel inside the "V" and are made of a metal graphite for prolonged shoe and conductor life. The arms are cast aluminum and are spring loaded such that they can be adjusted for contact shoe pressure and vertical misalignment. Horizontal misalignment is also taken under consideration by utilizing a ball joint and a swiveling base that the arms are mounted to. Collectors are available in one, two, three, or four arms depending on the system requirements. Insulations are required but are not included and can be supplied at an additional cost. All spare parts and subassemblies are also offered as replacements. Features and Benefits - Composite crane conductor rail systems are used primarily on cranes that require a steel contact surface for extended wear and aluminum to increase amperage capacity in a compact, lightweight package. The high carbon steel contact surface is ideal for both gravity and spring loaded collectors and cast iron contact shoes. Choices of single or double insulator supports are available for either lower or higher amperage systems. They can be used for AC or DC voltage applications. Insulators will be sized according to voltage and system heights. Our sales and engineering staff can assist you in system design and application. Conductor Rail - Composite rail consists of an aluminum base extrusion and a high carbon steel "T" contact surface bolted together for high durability and extended wear. Conductors are supplied in 30 foot sections and drilled for splice joints. Shorter lengths are available upon request. Collector Assemblies - Collectors consist of a corrugated mounting frame with slotted holes for adjustment, a spring loaded arm and swivel contact shoe that assures a positive contact with the conductor rail. Flexible copper cables connect the terminal lug with the contact shoe. Reversible contact shoes insure longer life and are replaceable without removing the collector from its mounting position. Gravity paddle type shoes are also available in various sizes and styles. All spare parts and subassemblies are also offered as replacements. Hanger Assembly - The hanger assembly is used to support the composite rail. It is used with an insulator to ensure no electric current is passed to the structural support the conductor system is mounted to. The hanger is cast aluminum and coated with a reduced friction plastic to eliminate conductor binding. Double Insulator Assembly - The dual insulator assembly will provide extra cantilever strength when using large rails. It can be mounted at splice joints and consists of two insulators, a steel bar, and cast iron rail grips. They can also be mounted in an underrunning or overrunning condition. Lugs can be purchased separately. Complete systems are available from 500 to 1750 amperes. Conductor components, collectors and collector parts for all sizes and styles are available. Features and Benefits - H-Beam aluminum conductor systems provide a lightweight and efficient means of supplying power to all types of cranes and material handling equipment. H-Beam systems are available in 500, 750, 1000, 1250, 1500, 1750, 2000, 2500, and 3000 ampere ratings in both AC/DC voltage applications. Since there is no field welding or drilling involved with H-Beam aluminum conductor systems, installation costs can be kept to a minimum. MacCabe can also furnish specially designed systems for corrosive or abrasive atmospheric conditions, waterfront loading, severe weather, and exceedingly heavy wear conditions. Unique features are built into most MacCabe systems as well as the development of new hardware and conductive materials such as copper and bronze that are also available. All the conductors are designed for total reversibility. Conductor Rail - H-Beam conductor rails can be mounted in underrunning or side wipe applications. Being aluminum, the H-Beam rail is structurally strong, allowing maximum support spacings. The conductors are made of highly conductive aluminum alloys and come in 30 foot standard lengths. Shorter lengths are available upon request from the factory. Technical data is also available upon request. 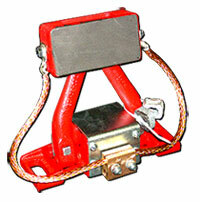 Collector Assemblies - Collectors are used to pick up current from the conductor rails and transfer it to the crane. 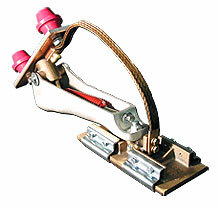 The contact shoes that travel on the rails are made of metal graphite brass to promote long shoe life and to prevent premature conductor wear. The arms are cast aluminum and spring loaded for positive contact. The shoes are sized to accommodate conductor misalignment. They can be mounted in either underrunning or side wipe applications. Collectors are available as one, two, three, or four arm assemblies depending on the amperage load. Insulators are used to mount the collectors to the crane's support structure and can be purchased separately. Minimum phase to phase spacings is 6-1/2" for 300 to 2000 amp systems and 8" for 2000 to 3000 amp systems. All spare parts and subassemblies are also offered as replacements. Complete systems are available from 300 to 3000 amperes. We can supply Conductor components, collectors and collector parts for all styles.